Right from the opening drive it didn’t feel like it was going to be Lehigh’s day. With sophomore QB Brad Mayes in for senior QB Nick Shafnisky, who was unable to start due to an undisclosed illness, a pass that bounced off the hands of senior WR Derek Knott instead bounced into the hands of New Hampshire’s first team all-CAA CB Casey DeAndrade. Six plays later, the New Hampshire offense converted that turnover into the very first touchdown of the day for the Wildcats, the first of many on a defense that clearly missed senior LB Colton Caslow, who got hurt in the second half against Lafayette last weekend. Four different New Hampshire players scored a grand total of six rushing touchdowns, two coming from RB Dalton Crossan, two coming from his backup, RB Trevon Bryant, one from the third-string, RB Evan Gray, and one on a scramble from QB Adam Riese. 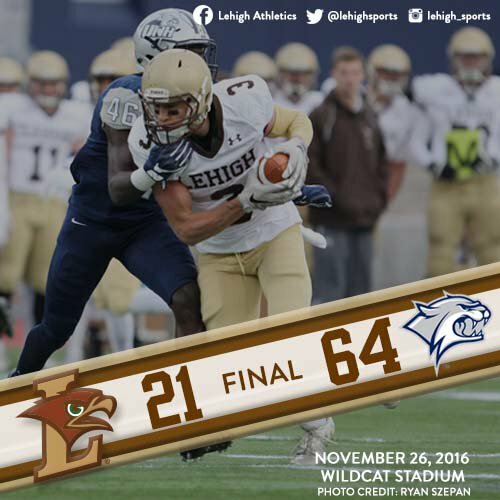 All in all, the Wildcats racked up 364 yards rushing on the Brown and White, rushing to a 36-7 lead on the Mountain Hawks and coasting to a 64-21 victory. 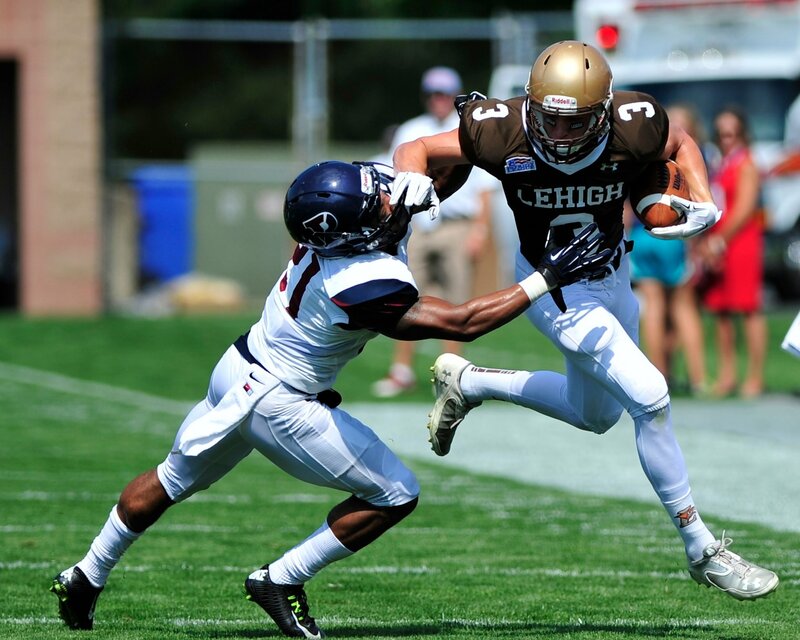 In the ultimate twist of irony, Lehigh got beat in the way they had beaten so many opponents in their nine game regular-season winning streak – with UNH jumping to a big lead and never really taking their foot off the gas. It is an easy narrative to point at the 150th meeting of The Rivalry as the turnaround for the Lehigh football program, where the Mountain Hawks got together after that bitter, bitter loss and decided that enough was enough, and that they were going to not allow their team to be a cellar-dweller. For Lafayette, though, you need to go back further, past some very enormous wins over Lehigh, and wonder. The co-championship they shared with the Leopards that year had the feel of the worst consolation prize imaginable. For the second straight year, Lafayette had stolen the FCS Playoff bid right from under the Mountain Hawks, and it was Lehigh left to sit at home to stew. The post game press conference was as down and dark as could be, the double indignity of losing to Lafayette, and losing any chance at a postseason bid, at the same time. It felt like Lafayette was on the brink of becoming permanent contenders for the Patriot League championship, meaning their torture of Appalachian State and UMass in the playoffs in consecutive years would be a regular happening over the next decade. 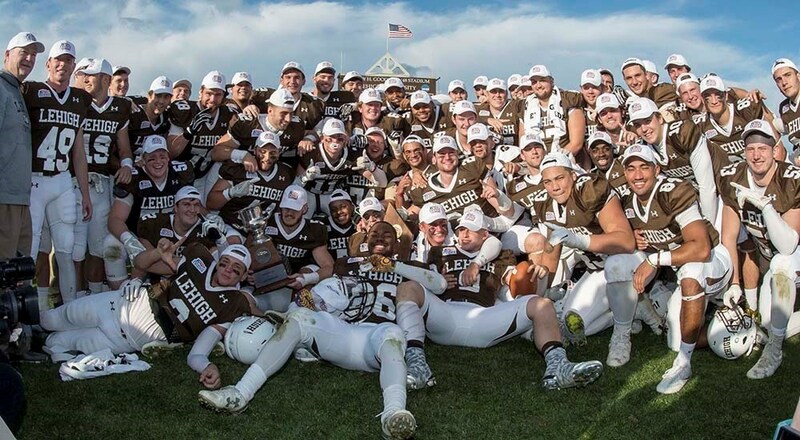 This year, Lehigh travels to Easton in their big Rivalry game, sitting at 8-2 and having already clinched a portion of the Patriot League championship, only seeking to remove the “co-” from the word “championship”. As emotions go, the Mountain Hawks couldn’t be riding more of a high, winners of eight straight. And Lafayette sits at the opposite extreme, sitting at 2-8 and wondering how they’ve gotten to this point, with only three wins over the last two years.